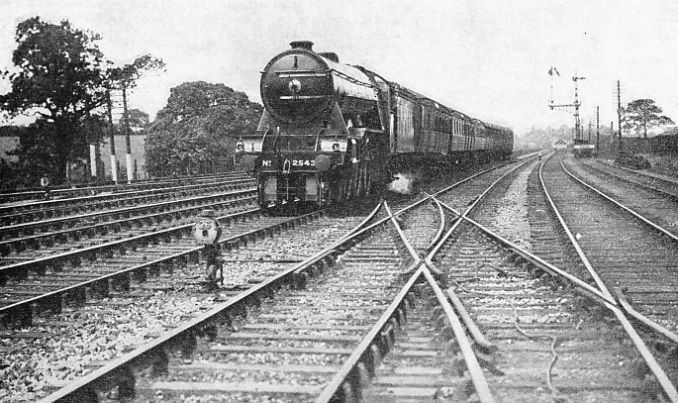 AN EXPRESS OF THE LNER is seen running at speed, headed by “Pacific” locomotive No. 2543 “Melton”. 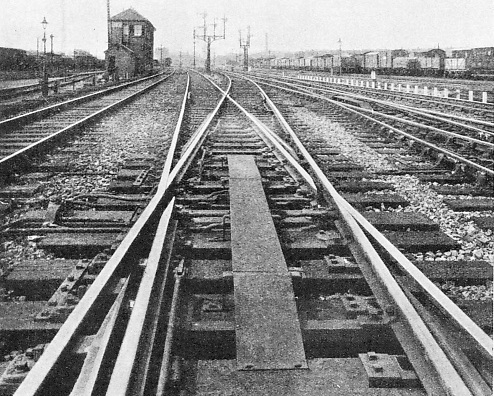 In the foreground is seen a “single slip” - a diamond crossing of two tracks with slip connexion between them. which face the permanent-way engineer. The complexities of junction lay-out work and connexions between one track and another require separate consideration. In the above chapter emphasis is laid on the punishment to which railway track is subjected as the heavy weight of locomotives, coaches, and wagons rolls over it, sometimes at very high speeds. To the line-side observer this may not be so apparent as to those immediately concerned with maintenance problems; but even the uninitiated, as they hear an express thundering over a junction, must realize by the sound alone that the track at such points as these is being subjected to enormous stresses. They are at their maximum where one track crosses another, and the wheels have to bridge the gap in the rail which is necessarily left, so that the flanges of wheels using the other track may pass through. First of all it is necessary to study the details of an ordinary “turn-out” - that is, a set of points or switches, and the crossing that is needed to enable the outer rail of the diverging track to cross the inner rail of the straight track. A typical cross-over, a picture of which appears below, is that at Theydon Bois Station, Essex. rolling stock resting on the wheels, when the train, perhaps, is travelling very fast. A variant of the knife-edge type of tongue, largely in use on the Great Western Railway and to a lesser extent on other lines, is obtained by setting the stock-rail back three-eighths of an inch, exactly opposite the point of the tongue, so that the latter may be planed down to a point three-eighths of an inch thick, instead of to a knife-edge. This has a considerable advantage in giving the tongue a longer life, as it does not wear away or suffer damage so readily as a knife-edge tongue, but there are also certain disadvantages to be faced. A reverse bend, or “joggle”, has to be made in the stock-rail, within a length of no more than four to six inches, to form the recess that houses the thick tongue, and this recess runs out into the straight again at a point opposite the end of the planing. The result, when the tongue is open, and the stock-rail exposed, is not merely to make the latter look out of straight, but also to leave a slightly projecting angle in the running edge of the rail. This may cause rough riding to trains coming through the switch in a trailing direction, and is inclined to wear down with undue rapidity for the same reason. It would, however, take considerably more space than a single paragraph adequately to argue the relative merits of “straight-cut” (joggled) and “under-cut” (ordinary) switches. switches in the running lines. The lateral movement of the tongue, from the closed to the open position, is usually from four to five inches. A special type of chair, known as a “slide chair”, is used throughout the movable part of the switch. That is to say, a chair with a jaw on one side only, to which the stock-rail is bolted. The other side consists of a flat seat, kept well oiled, on which the tongue-rail slides. At the back end of the switch, beyond the movable portion, both rails are securely keyed in double chairs, known as “heel chairs”. There is sufficient spring in the tongue-rail to permit of its movement to and fro with the “heel” as a pivotal point, and it is only in short switches, where excessive spring would be needed, that a joint is made in the tongue-rail at the heel. wheels exert a strong outward thrust as they are diverted from their straight path by the tongue, and were it not thus held rigid throughout they might force the tongue out of gauge, and cause a derailment. Connecting the two tongues together, so that they move in unison, are the stretcher-bars, now usually cut from a length of rectangular spring steel, which is set up on edge, and joined to the rails by forged steel clips. To the outermost of these bars - that is, the one nearest the point of the switch - is attached the “pull-rod” by which the switch is moved, either by rodding from the signal cabin, or, in sidings, by an adjacent hand lever. It is vitally important that the switch tongue, when in the closed position, shall have moved fully home, as any projection of the tongue away from the stock-rail might easily cause a derailment. This is where electricity plays its part. In all switches in “running roads” - that is, lines over which through traffic is moved, as opposed to sidings - electrical “detectors” are fixed. These can tell, almost down to the thickness of a piece of paper, if the tongue is properly in contact with the stock-rail. If not, electrical locking prevents the moving of the signal-arm, which will permit a train to travel over the switch. At important facing switches in running roads “locking-bars” are now therefore provided. They consist of a length of light “T” or “Γ” section, usually 40 ft, carried on hinged arms which are bracketed at the side of the rail. 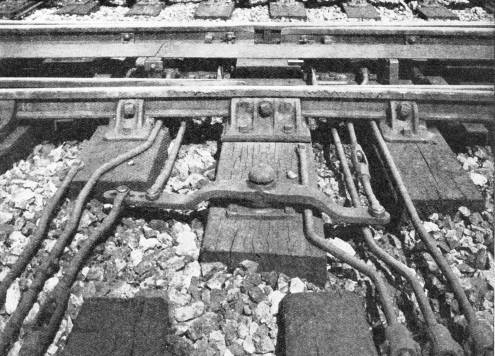 The locking-bar, connected to a plunger device which is usually fixed down in the middle of the track, normally lies horizontally, either on the inside or the outside of the rail immediately adjacent to the switch, and just below rail level. In this position the switch is “locked”, and no amount of effort on the part of the signalman can move it. When a switch movement has to be made, the switch must first be unlocked. By pulling over the appropriate lever the signalman causes the rocker-arms of the locking-bar to move through an arc, thus lifting the flat bar momentarily above rail level, and then dropping it again. The switch is now unlocked and can be moved. But before the appropriate signal can be moved to “clear”, the facing-point lock plunger sees to it that the switch must be re-locked, which means putting the locking-bar lever back into the frame, and so moving the locking-bar itself back through the same arc as before. IN OLD OAK COMMON YARD on the Great Western Railway, near Paddington. To the right of the cabin is a single slip connexion, and behind that a single-tongue trap. Now the rising of the locking-bar above rail-level means that the operation of unlocking and relocking cannot be accomplished when any vehicles are standing on or moving over the track immediately adjacent to the switch. The 40-ft length of the locking-bar is greater than the maximum distance between any two pairs of wheels of the longest coaches in use. This simple precaution thus prevents any movement of a switch equipped with a locking-bar when a train is travelling over it or standing on it. Locking-bars are fixed either on the tongues of a switch, or, more generally, on the stock-rails adjacent to the switch. Several can clearly be seen in the photograph of movable diamond crossings shown below. 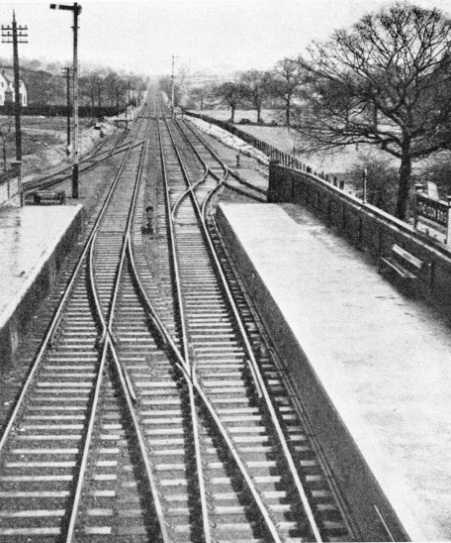 Problem - which would occupy too much space for detailed description - has recently been reached, however, jointly by the Engineering Department of the LMS and Messrs. Taylor Bros. (Sandiacre), Ltd, the well-known manufacturers of permanent-way lay-outs, and will provide for properly super-elevated junctions safely permitting speeds of sixty to seventy miles per hour over either track. The value of this development in these days of high-speed travel needs no stress. As less in the matter of precautionary measures is needed with a trailing than with a facing switch, in running roads trailing switches are laid in wherever possible. Cross-over roads between the two tracks of an ordinary double line, for example, such as that illustrated at Theydon Bois Station, are invariably laid trailing. Connexions from sidings, such as the one seen beyond the right-hand platform in the same photograph, are also laid to trail, except in the case of “reception roads”, which are entered through facing points, and left through trailing points. The advantage of the reception road, as compared with an ordinary siding, is that the time spent in stopping a long and heavy freight train, and setting back into a siding, is completely eliminated by the train passing direct into the siding through facing points, and there is a correspondingly quicker clearance of the main line. A STRIKING YARD LAY-OUT at Winnipeg, on the Canadian Pacific Railway. 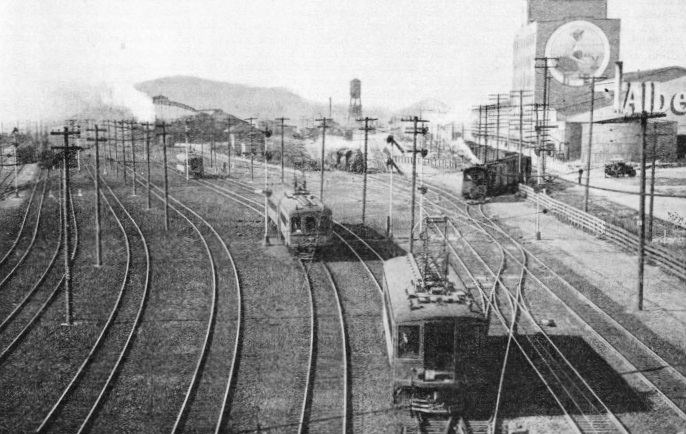 In the distance is seen the “hump” at the entrance to the yard, over which the trains are slowly pushed, the uncoupled wagons being run by gravity into their appropriate sidings. because of the thinness of the inner set of tongues, and the general complexity of construction as compared with a pair of ordinary switches. Given adequate space, the permanent-way engineer will use two independent switches instead. Another type of switch which may have puzzled some readers is a single tongue, set in one side only of a straight track -that is, half a switch, and leading, in effect, to nowhere. It is deliberately designed as a trap. Where a station, for example, is located on an incline, there is the risk that, while shunting, wagons might start to run away down the “wrong line”, and if they met a train proceeding in the opposite direction, the result would be disastrous. The trap would, however, throw the vehicles off the road in time, and by the lesser casualty the greater would be avoided. Trap points are generally arranged to work against a spring, so that trains travelling over the trap in the right direction force the tongue to close, after which it again springs open automatically. A single-tongue trap can be seen in the photograph of Old Oak Marshalling Yard of the Great Western Railway. RELAYING A “SCISSORS CROSSING”. This unit of track, weighing 25 tons, and 100 ft in length, has been assembled at the side of the main line, and is being moved into position on ball-bearing rollers. It consists of a double cross-over road, and the complications of the centre crossing construction is clearly seen. consists of two rails secured together, and planed down to a sharp point or nose. It is the straight rail, known as the “point-rail”, which is planed down to the nose. The rail of the diverging track is slightly bent and twisted, and then planed head and foot in such a way that it can be firmly bolted to the side of the point rail, with the two webs touching. Between the point and splice-rails and the two wings gaps or flange-ways must be left wide enough to receive the flanges of the wheels as they pass through, the customary space being 1⅝ inches. Strong double chairs hold the rails through the crossing, and from the nose to the end of the wings each crossing chair, which is of considerable length, must hold four rails. In addition, cast iron blocks, accurately shaped, are fitted between the wings and the point and splice-rails, with bolts running right through from one side of the crossing to the other. Their purpose is both to prevent the point from moving longitudinally in relation to the wings (which might either close up or open out the flange-way gaps), and also to keep the rails at precisely the right distance from one another, as on the preservation of this distance smooth running through the crossing largely depends. A SIDE VIEW of the movable diamond crossings at Old Oak Common. Standard common crossings are made in all angles from 1 in 4 up to 1 in 12, together with half-angles, such as 1 in 8½ or 1 in 10½. This variety of angles entails the stocking of an enormous variety of crossing chairs, as each angle must have its own set of chairs and blocks, distinctively marked. For special work more acute and more obtuse angles are made at times, culminating in right-angled crossings of one track over another. But the last-mentioned are avoided if possible, as they involve special design and manufacture. They are costly to maintain in good running order, and cause rough riding to rolling stock. MOVABLE DIAMOND CROSSINGS provide a solid path for the wheels, as shown by the right-hand rail through this crossing at Old Oak Common West Junction. The point-rails of the diamond are arranged to move like switches and are coupled together by the cranks as shown above to make them move in unison. Two are always open when the other two are closed. Locking-bars are placed alongside the running rails to ensure safety. This leads us to the consideration of complete crossings of one track over another, which are known as “diamond” crossings, from the diamond shape that is enclosed by the four rails. One diamond crossing occurs at every double line railway junction. At the extreme ends of such diamonds two common or acute crossings are needed; but at the centre there are two crossings of a different type, known as “angle” or “obtuse” crossings. coming up to the centre of the crossing, or the “knuckle”. Endeavours are made to keep obtuse crossings to a maximum sharpness of 1 in 8 or 1 in 9, as with leads of 1 in 10 and upwards there is the risk of a wheel-flange taking the wrong side of a point, which would cause derailment. But any such risk can be overcome by the use of movable diamond crossings, which have the advantage of completely closing up the flange-way gaps at the centre of the diamond, thus giving a solid path for the wheels, and greatly increasing the smoothness of running. Southern Railways have specialized in this form of junction construction, an example of which, at Old Oak Common West Junction on the Great Western Railway, figures in the illustrations above. Some use is also made by the Southern Railway of spring common crossings, which, similarly, give a solid path for the wheels through the crossing, but this track detail is more common in America than in Great Britain. is provided - an even more complicated piece of work - then the item becomes a “double slip”. Examples of slip construction appear in several of the photographs in this chapter. 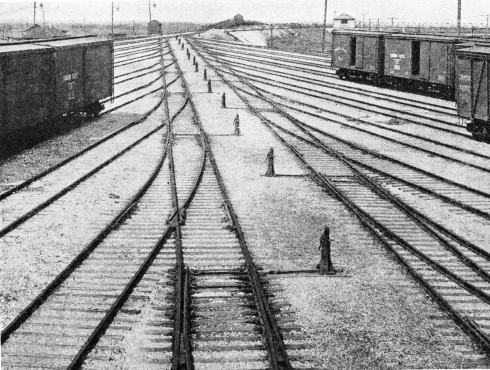 AMERICAN RAILROAD TRACK built up from flat-bottomed rails is seen to advantage in this picture of the approach to Oakland Pier Terminal of the Southern Pacific Railway at San Francisco. Note the “double slip” connexion to the right of the electric motor-coach in the foreground. Another complicated form of track construction is the double cross-over road, or “scissors crossing”, from its resemblance in form to this household implement. This is laid where cross-over roads in both directions are needed, but compactness is essential, as, for example, at stations in the centre of long platforms, so that access may be readily obtained to or from one end of the platform when a train is standing at the other. Here again two independent cross-over roads, end to end, will be used if possible, as the complexity of construction, particularly at the centre, makes the scissors crossing a costly item, Another objection is the shortness of many of the rails which must be used in its centre section. 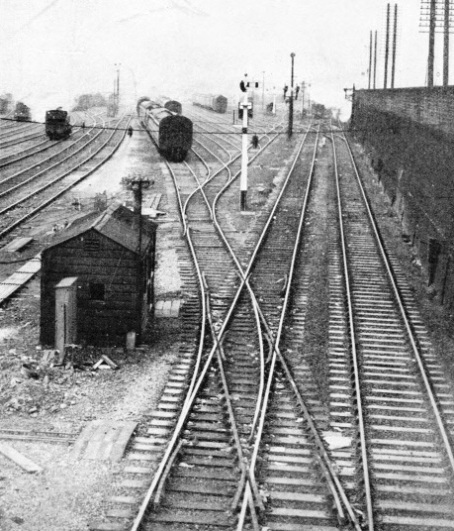 An example of a scissors crossing, in course of being laid in the LNER main line at Thirsk, figures in one of the illustrations above. The title “double cross-over road” may also be applied to the double connexion between two parallel double tracks of a four-track line. A junction of this description comprises four sets of switches, eight common crossings, and four obtuse crossings. It should here be added that the switches at both ends of every cross-over road are linked together in such a way that both are simultaneously operated by one lever in the signal cabin. Whenever possible, track lay-outs are assembled from standard switches and crossings, but more complex lay-out work requires special planning and construction. In particular, curves in the tracks which have to be connected complicate the use of standard parts. 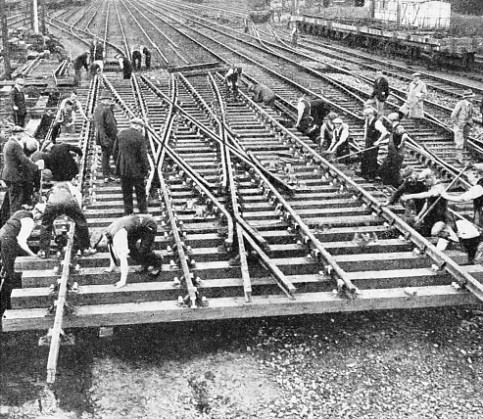 Whereas a great deal of work in cutting and bending rails to fit was formerly done on the site, when replacements were in progress, the more modern and scientific practice is so to plan and assemble the details of a lay-out that it can practically be dropped into position and fishplated up to the adjacent track directly the worn-out track has been dismantled and removed. Railway before the extension of electric working into that terminus. It was planned as one vast unit, built and assembled in sections in the contractors’ works at Sandiacre, near Nottingham; dismantled and reassembled in a field at New Cross; and finally, after all traffic into and out of Cannon Street had been temporarily stopped, and the old track on the bridge removed, it was laid in position, as shown in the fine photograph shown in the chapter on Electric Power on the Grand Scale. cause rough riding of rolling stock, especially when such crossings are traversed at speed. Where steel castings are used in crossing work, it is generally in connexion with flat-bottomed and not bull-head railway track. The most successful use of castings has been in difficult and complicated locations, particularly where tracks cross each other at right-angles, or nearly so, and also in conjunction with the use of alloy steels. Of these the best-known examples in Great Britain are crossings that have been assembled from the high manganese alloy associated chiefly with the names of Hadfields and other firms in the Sheffield area. The most striking and extensive of these crossings is probably the one found at the east end of Newcastle Central Station of the London and North Eastern Railway. Here tracks from the north side of the station, curving sharply round to the southwards to reach the High Level Bridge, cross, almost at right-angles, the main line from Edinburgh into the through portion of the station; the whole of these crossings have been assembled from specially cast manganese steel crossings. Rails rolled from manganese steel are also used in the manufacture of switches and crossings for locations where the wear is excessively heavy. Another favourite alloy for this purpose is a steel containing 1 per cent of chromium. Heat treatment is also freely employed for the hardening of crossing noses, and rails which have been heat-treated in their entirety by the Sandberg regulated sorbitic process similarly find considerable favour in the building up of lay-outs subject to severe wear conditions. COMPLICATED TRACK CONSTRUCTION at Llandudno Junction, Wales, on the LMS Railway. From the right of the picture one track bears left and crosses the double line curving to the right almost at a right-angle. Crossings of this description are avoided where possible as they are costly to maintain in good running order. You can read more on “From Iron Ore to Steel Rail” and “The Permanent Way” on this website.